Autism Spectrum Disorder is a developmental disorder impacting social skills, language and communication, sensory sensitivities and rigid or repetitive behaviours. Autism is a spectrum disorder meaning each person with autism may present differently and therefore can require different supports. While the disorder is a lifelong condition, there are lots of different strategies that can help develop a child’s emotion regulation skills, communication, social skills and independence. Below are ten tips that I have found helpful for parents and teachers to use either in the classroom or at home. Children with autism can find it difficult to plan, organise and complete tasks. This is known as executive function skills. To help children plan tasks, it is recommended to break the steps down and be mindful not to give too much information at once. Having the child repeat back the instructions can help you know they have heard and understood the steps. 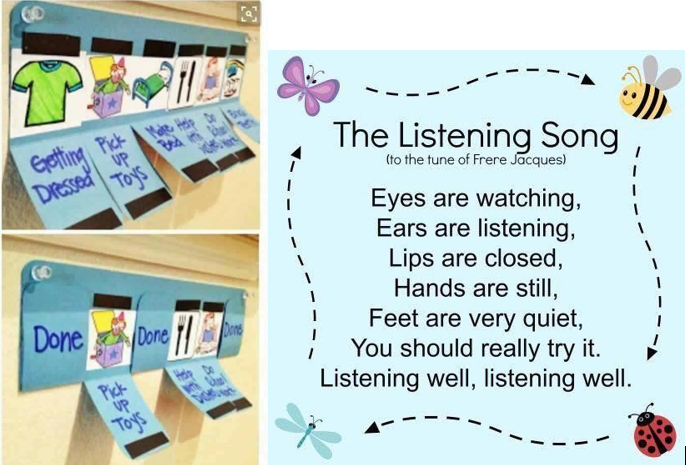 Teaching the instructions with a song, like a cleaning up transition song commonly used in preschools, can help the child remember where and what they are supposed to be doing. Consider using picture checklists that children can easily double check the step they are up to and can tick off when complete. These checklists can also be helpful for you to see which steps they have completed, which step they are up to and which steps they have trouble completing. Sensory stimulation, such as bright lights, constant noise (like the hum of an air-conditioner), or crowds may trigger a feeling of being overwhelmed. When overwhelmed a child will have difficulty learning or can feel unsafe. It can be helpful to set up a room in the house or a corner in the classroom which can become a safe zone. Try using low lighting and putting a weighted blanket, physio putty, squishy balls, and noise reducing headphones. This area should not be used as a punishment or timeout rather a proactive strategy for students who feel their sensory issues escalating. I like to invite the child in by identifying the issue and give them options of what they can do to help meet their sensory need. For example, “Joshua, I see that you look overwhelmed with the noise. Would you like some time in the quiet area and use headphones or the blanket?” By giving the child options they are starting to develop their independence with managing their own regulation. It is preferable that the child can re-enter the main classroom when ready although a timer can be used if transition is hard. Think also about the “noisiness” of the decorations in the classroom as too many posters or clutter can feel overwhelming. There is a big difference between saying “stop being messy” versus giving a clear boundary such as “we don’t throw rubbish, put it in the bin”. The second gives the child a clear understanding of what is expected from them. This is particularly helpful for children with autism who may not be able to intuitively understand the social rules. All children are more likely to follow the rules if they are stated clearly before going into the setting. For example, “We are about to go into assembly. We will walk to the floor and sit down. When people are speaking it is important to listen. I know you are listening if you are sitting still, eyes are looking at the speaker and you are not talking.” Rewards can be a great motivator especially those that are consistent, timely and attainable. Another positive strategy is to model your own emotion regulation skills. The more people modelling how they experience and handle strong emotions gives your child even more strategies on how to manage their own. It can feel a little weird talking about your emotions with your child, but it does get easier with practice. If a child’s emotions or behaviour are escalating they can find it difficult to listen logically to what you are saying. Further, a child who struggles managing their own emotions is going to find it even harder if they are witnessing your strong emotions when trying to discipline them. For example, when raising your voice, you might be yelling “I told you not to throw the toy!” but what they are hearing is “I’m really angry, you’re doing everything wrong”. Instead, try a lower, even toned voice and use minimal words e.g. “we don’t throw toys. Go pick it up”. In this example, the child is given the behaviour boundary they have crossed so they understand what they did wrong. They are then given a clear action of how to make it better. When the situation has deescalated, you can then discuss emotions and how their behaviour impacts on others, such as “when you threw the toy it made me angry because its important to look after our things”. By taking this approach your child hears what you are saying, the behaviour stops escalating, boundaries are reinforced, and you will feel calmer. 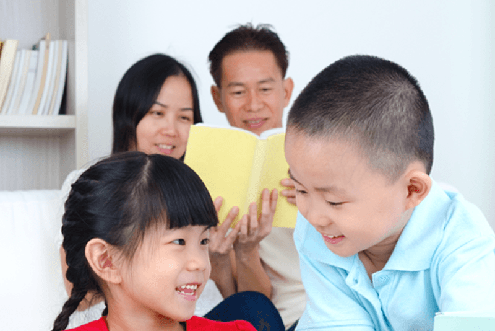 Some parents and teachers are wary of using visuals due to a misconception that visuals impede verbal development. However, research shows the opposite that visuals actually improve communication and verbal skills. They can be extremely helpful, and I use them with nearly every client for various reasons. 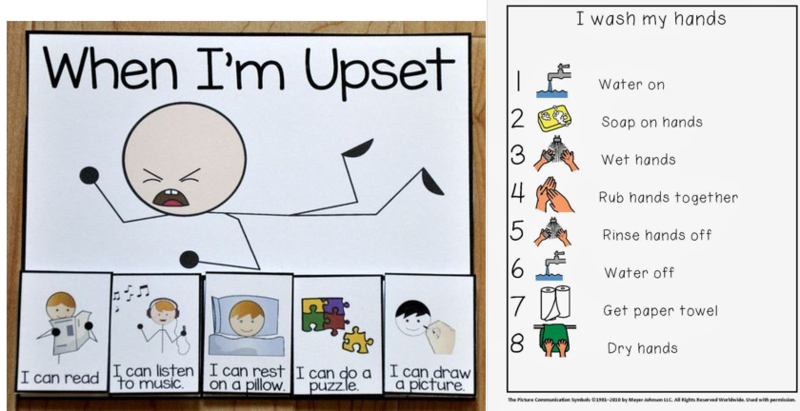 For example, toilet training visuals can be used to remind children of each step, a day schedule next to the whiteboard at school can be helpful for anxious students who struggle not knowing when their parents will pick them up, or emotion regulation visuals to remind children of their calming down strategies. 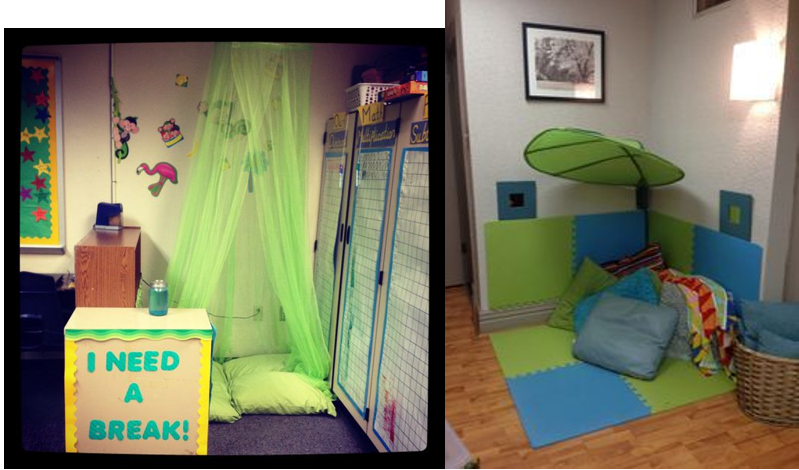 Visuals in a classroom not only help those with special needs but everyone. Another quick strategy I use regularly is drawing out the child’s problem. Children sometimes find it easier to communicate a problem by drawing rather than using words. Ask questions that are curious and non-judgmental to help them explore their thoughts and problem solve. For every strategy we introduce, there is a period of resistance and possible behaviour escalation, learning the new boundaries and then, if it is a successful strategy, we see positive change. Because of this, expect several weeks before judging a strategy as being successful. Obviously if a strategy causes major distress then it’s advisable to contact your therapist immediately to get support. 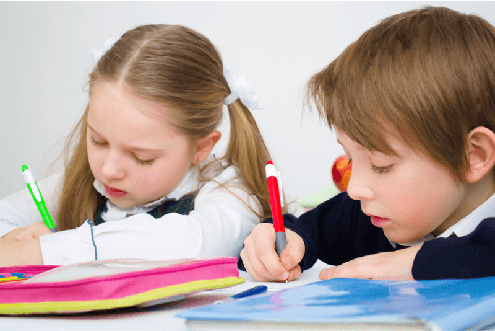 A good idea is to plan out several review dates such as two weeks and then four weeks where everyone can report how the strategy has worked at home and at school, any concerns and if continue or change the plan. A good behaviour strategy is founded upon the communication between school and home. When introducing a new strategy, it can be helpful to organise a face to face meeting. Avoid just listing every negative thing the child does and instead focus on the goals, what has or hasn’t worked, and what strengths the child has. Identify how you will continue communication (such as emails or communication book) and who is included in the updates such as assistant teachers, year coordinator or principal, school counsellor and any therapists too. Avoid trying to catch each other at pick up time as teachers are often too busy with supervising children and its preferred you don’t discuss your child’s issues in front of others. Maintaining a child’s dignity means that we respect the child as an individual and not defined just by their disability. A really important time to focus on maintaining the child’s dignity is during meltdowns. While a tantrum is usually the result of a child being denied something they want, a meltdown is due to them losing control over their behaviour and unable to regulate themselves. Meltdowns are intense, exhausting and scary and if they are not offered sufficient recovery they can be susceptible to reescalation. Because the child’s level of distress interferes with their logical reasoning skills, avoid trying to teach them anything new or getting them to reflect on their behaviour while in meltdown or recovery. Instead, validate their emotions, focus on the safety of the child and of others, and identify if you can help them soothe. Once the child has recovered you can then discuss with them what was the trigger, what they can do next time, and ask them how you can help them. If you and the child have agreed on an action plan, the next time the child starts entering a meltdown you are both prepared. Because of the child’s vulnerability throughout a meltdown, it’s important that we maintain the child’s dignity. This includes incorporating their child’s own thoughts and ideas into any plans, preventing other children from teasing or goading them into reacting, don’t label the child’s behaviour as naughty, separating the child from the challenging behaviours and respect their privacy by being careful how you discuss the child’s behaviour in front of others. This approach can help the child feel more secure and trust their carers. 10. Learn and develop attachment through play! Children naturally learn through play and it can be incredibly powerful tool to teach new skills. Skills that can be learnt in play include teaching patience, taking turns, how to cope with losing or failure, understanding others points of views, emotion regulation, making friends, how to listen to instructions, pleases and thankyous, coping with difficult situations, and problem solving. Another important outcome of play is building attachment with your child. You learn more about your child’s strengths and interests and the child sees you role model, is boosted by your interest in them and they get lots of praise and encouragement. And most importantly, it is fun! Fun game ideas include board games, blocks, puppets, doctors and nurses, pretend cooking, music, drawing, LEGO® for following instructions, but the list is huge! I recommend that you try repetitious, quick games for teaching patience and losing (e.g. snakes and ladders). This is because the child will have less emotion invested and will cope easier with losing in a shorter game versus a really long game like monopoly. As their resilience improves you can increase the length and investment in the game. Learning Links offers social skills groups for children to learn different skills in a relaxed setting with support. If you are interested please visit https://www.learninglinks.org.au/services/children-youth/psychology-programs/social-skills/ for more details or call (02) 8525 8222. Prioritise your own self-care. Remember to reach out if you need support and talk to other families. Between other parents, therapists, and teachers there is a wealth of knowledge about different strategies or even a friendly ear to listen. If you do feel overwhelmed, please talk to your GP for more support options. If you are interested in seeking support for your child, your staff or even for yourself, please do not hesitate to contact Learning Links on (02) 8525 8222 or visit our website at www.learninglinks.org.au. Learning Links is a NDIS provider and can offer support in meeting your child’s therapy goals.